Wow! So he's not quite as big a boy as Dortmund is, but is still quite sizable ^.^ He covers ground like your big horses, though. I immediately noticed how smooth and effortless his stride was, all your big loping horses --- Secretariat and Zenyatta, American Pharaoh and A.P. Indy, Spectacular Bid-- all came to mind for me when I saw him move. He floats like a swan while lunging like a tiger. He took one to every two of California Chrome's strides. Possibly too soon to say: but lightning just may have struck twice for Baffert! You are welcome. Good observations on Arrogate. 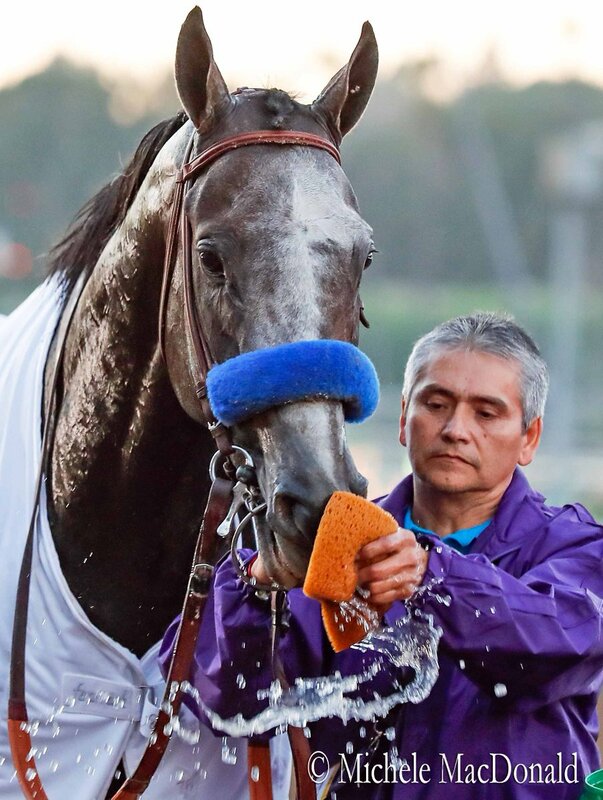 profiled Arrogate. This is an excerpt from his article. 06 November, 2016 Steve Haskin "Hangin with Haskin"
No one is putting Arrogate in the same breath as Secretariat, but based on these past two victories, I don’t know if I’ve seen a horse with an engine like this colt’s since Big Red. No matter what he does he never gets tired. His heart measurement and lung capacity must be off the charts. Although he no doubt gets his brilliant two-turn speed and his massive stride from his sire Unbridled’s Song, they are nothing alike in action, as Unbridled’s Song ran with his head up and Arrogate runs with his head down with the bulldog tenacity of In Reality, to whom he is inbred top and bottom, and the determination and grit of his great-grandsire Forty Niner and great-granddam Meadow Star, both champions. By running so low, Arrogate gets a good deal of thrust up front and behind when he extends his stride, generating an enormous amount of power. Bubbler, Arrogate's dam, just sold for $4.7 million at the Fasig-Tipton November sale. EDIT: It actually looks like she was a buy-back. Well I'd buy her back at any cost too! What does that mean? I'm not up on auction stuff. Thanks! It means she didn't meet the reserve price that her owners set, so they bought her back. It's also known as an RNA (reserve not achieved I think?). Wow! What were they asking? No clue. I don't think they typically advertise the reserve price, but it might depend on who's selling. Remember big controversy in Saratoga sale where I think Candy Pope or Jackson had a sale horse and the sale got interrupted because the auctioneer got RNA price wrong? Horse had to be sold privately, and the mixup was a great embarrassment to agent and breeder? Pretty sure it was a Jackson horse. The auctioneer was mistakenly given a too high RNA. I still don't understand the language of "buy back". Reserve not met is self explanatory, but "buy back" makes it sound like someone else currently owned Bubbler and, as the previous or original owners, they decided to buy her back. Somewhat confusing --- can someone explain, please! I think for the sale, the offerers have to buy back the horse. I don't know what kind of financial transaction is involved. Maybe paying a fee to auctioneer? I know it seems confusing since seller already owns horse. Any takers out there? In an auction, a horse is usually sold to the highest bidder, though there are some methods of protection that are designed to allow consignors to refuse a final bid price. Keeneland, Fasig-Tipton, OBS, and other sales companies offer reserve prices. This allows a consignor to set a reserve price and any bids above that set price will allow that horse to be sold. For example, if a consignor wants to accept no less than $25,000 for a horse, he will set the reserve at $24,999. The auctioneer and bid spotters will work the price to $24,000. At this point, the minimum bid is $1,000, so the next bid will take the horse past the reserve and allow the horse to be sold. Of course, the bidding could continue far beyond $25,000. It is also common practice for the owner or consignor to bid on his own horse himself. The conditions of sale clearly allow for this. This is another way that a consignor can protect the price of his horse in the ring. The consignor simply bids against potential buyers to raise the price to the desired level. This offers an advantage in that the consignor can help control the pace of the bidding. Another advantage is that interest can be gauged by the consignor and improvises can be made. This may be a disadvantage because some people view consigned bidding as unethical, even though the rules clearly permit it. The method to use is clearly up to the owner/consignor. One word of caution is that if you bid on your own horse and are the final bidder, you will owe commission to the sales company, so be careful. You might still own the horse you intended to sell and owe a commission at the same time. Also, is that cotton I spy in Arrogate's ear? Interestingly enough, the livestock auctions where horses may end up purchased by kill buyers have the same rules, I guess. The owners often bid up their horse, which the Rescues hate. There is also sometimes a reserved price the owner wants to get as the minimum bid only they call the end result (when the reserve price is unmet) a "no-sale." Or they say the horse "no-saled." @marepower --- thank you for the explanation --- clear and concise, now I understand and it makes sense! Is Arrogate (2013) the only foal for Bubbler --- I can't find any info on additional foals. She has a MdO yearling filly and a GC weanling filly. The rescues shouldn't hate that . . . Bidding up a horse in that kind of scenario is usually an attempt to keep them AWAY from kill buyers and into homes. @marepower --- thank you A+for the explanation --- clear and concise, now I understand and it makes sense! Thanks @EliRose --- don't know where to look for mares progeny --- that's "free" info, except PedigreeQuery. I usually just kept "web searching" until I find what I'm looking for, but, I'm too tired tonight and I knew a forum member would have the info. Thanks also for some of the "insider" information you post, i.e., I had no idea that Cathryn Sophia was so aggressive --- a real mean race mare! Maybe retirement and becoming a "Mom" will improve her disposition! If Bubbler were mine, I'd want to keep her. Arrogate is her first foal and he's a speed freak, big, with a tremendous stride. She has two fillies out of top notch stallions. Wonder who they will breed her to next year? She nicks A+ with Liam's Map and he's out of Unbridled's Song and she nicks A++ with Tapit. To find her other foals, you can check the mare's catalog page, which is linked on the sales catalog. Just click on her hip number. The page will show her entire produce record. I watched over half of the sale, and I was very interested in seeing Bubbler. I wanted to see how much of the mum was in the horse. She didn't disappoint! She stormed in like she owned the place, and could barely sit still; she stood tall and proud, and whinnied constantly. She and Love The Chase are spitfires! And Arrogate definitely takes after mama. I took lots of pictures for @Rachel (I didn't for Love The Chase, because I knew my friend already knew what she looked like) of horses that interested, or stood out to me. Bubbler was one of them, I will post her here. Are you in Kentucky RR12? For some reason I had the idea that you lived in Washington state.